No matter what your age, it’s good to be able to identify different spices by their look and smell. Make a spice chart to learn the different spices. Even in early childhood, I did infant stimulation exercises with my babies, having them smell different spices while I was cooking or baking. 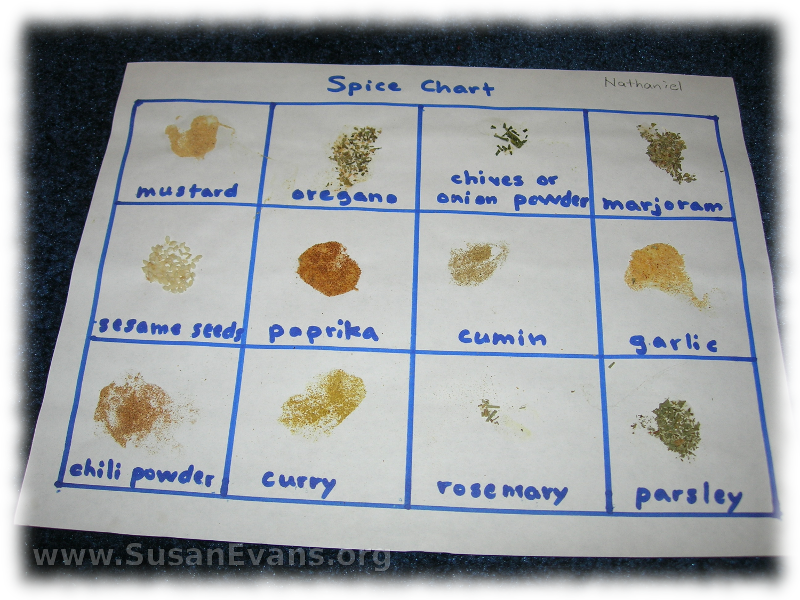 When the children got a little bit older, we made a chart of different spices, making a grid and labeling each box. Then we put a circle of glue in the middle of a square and dumped a little bit of spice on it. If you pick it up, all the excess spice falls off. We did this with each square. The next day when it was dry, even my toddlers were sniffing the different spices, and my elementary-aged children told the toddlers what the spice was. I recently saw a spice chart at the fair that is a variation on this idea. You make a “lift-the-flaps” chart by taping squares of paper on top of each square. Glue the spice onto the outside of the flap. See if you can identify the spice by the smell and the look. Then lift the flap to see the word, to check if you were right. One time when my second son was 6 years old and was helping me cook, he cried out, “That’s not oregano, Mom!” I had accidentally gotten the wrong spice, and my son could tell by the smell that it was the wrong spice. I’m telling you, it’s useful to be able to identify spices. This entry was posted on Tuesday, October 5th, 2010 at 7:40 am	and is filed under Early Childhood. You can follow any responses to this entry through the RSS 2.0 feed. You can skip to the end and leave a response. Pinging is currently not allowed. What a great idea. Growing up, very few spices were used in cooking, so I didn’t know much about how they looked or smelled or tasted, much less how to use them. It sounds like a wonderful gift you have given your children. It’s great to have a knowledge of different spices to improve what we cook. I love that my kids are learning about what different spices smell like and taste like so that they can experiment in the kitchen. Whether you home school or not it nice to have fun educational activity for the kids. Something they will enjoy and learn something useful at the same time. This was definitely fun for my kids, and they learned a lot! Neat idea! I wish someone had done that for ME as a kid, lol! I had to blunder my way through spice usage after getting married. I think my kids know more about spices that I do!